Elmore considers himself more than just a personal trainer but The Body Transformation Expert. With a background in weight loss, body sculpting, athletic performance enhancement and physical therapy, he has the track record that attest that he can get you the results you’ve been looking for. Elmore has been featured on two of the top online Health Fitness sites (Ehow and LiveStrong.com). Our Clients become our Friends and we treat them like Family because “Your Goals Become our Goals” and that’s how our Win-Win Relationships work this is a Partnership and Team Work will Make the Dream Work! Contact us today 404-798-1324. Elmore not only have the passion for transforming bodies but he has the certifications to back it up. He received an Exercise Science degree from Mississippi State University and has developed weight loss, muscle, and strength training programs for clients with physical and medical limitations such as the following: Type I and II diabetes, high blood pressure, cholesterol, knee and hip replacements, shoulder and back Injuries, bulging, herniated disks, polycystic kidneys, fibromyalgia, arthritis, ACL and LCL Injuries. Elmore has effectively trained over 25 doctors in weight loss, as well as increased clients’ awareness through health and lifestyle management education. 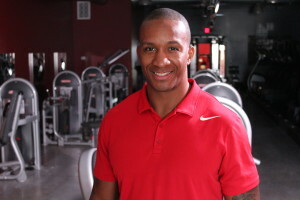 His certifications include AFAA, ISSA, ACE, NASM, CSCS and ACSM.